Updated to include remarks from Kim Hamilton. October 27, 2017 (Jamul) --The Hollywood Casino Jamul-San Diego has been granted a permanent license to serve alcohol by the state department of Alcoholic Beverage Control’s Administrative Law Judge Adam Berg. The ruling came over the objections of Supervisor Dianne Jacob, the Sheriff, the Jamul-Dulzura School District, and numerous residents in rural Jamul. The decision makes permanent a temporary alcohol license granted when the casino opened approximately a year ago, but also mandates that the tribe continue its previously voluntary restriction to limit alcohol sales to the hours of 10 a.m. to 1:30 a.m.. View the decision. 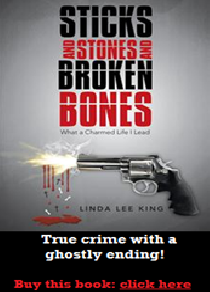 Sticks and Stones and Broken Bones: What a Charmed Life I Lead, by Linda Lee King (Abbott Press, Bloomington, Indiana, 2014, 269 pages). October 17, 2014 (San Diego)--Linda Lee King, a recovering Catholic, news reporter, and publisher of a weekly newspaper, the Free Press News, who has struggled with Post Traumatic Stress Disorder (PTSD) since childhood, encapsulates that and all her experiences in a riveting book, Sticks and Stones and Broken Bones: What a Charmed Life I Lead. Growing up in 1950s America where children did not speak until spoken to and when the Catholic Church concealed many occurrences of inappropriate behavior, one moment in her young life caused trauma that would haunt her into adulthood. That sets the tone for this well-written book. Read more about LEADING A CHARMED LIFE! Laker Girl by Jeanie Buss, Triumph Books, Chicago, Illinois, 2013, 310 pages. The Los Angeles Lakers are at a crossroad in history and basketball lore and legacy. These last few years have not been kind to them, and author and Lakers’ VP in charge of basketball affairs Jeanie Buss puts it all in perspective in her book Laker Girl. She writes a candid tell-all account of the Lakers’ rise to basketball and sports’ glory, and their descent into implosion on a scale that is astounding, especially considering the legendary history and beginnings of this franchise. OSCAR® EXPERIENCE VIEWING PARTY IN SAN DIEGO FEB. 24: BENEFITS COMMUNITY CAMPERSHIP COUNCIL INC.
February 14, 2013 (San Diego) --The excitement and glamour of Hollywood are coming to San Diego on Oscar Night. Residents of San Diego can experience the thrills and surprises of the 85th Academy Awards on Sunday, February 24, at San Diego’s premier Oscar Experience. A viewing party benefiting Community Campership Council Inc will be held in Celebration Hall at Market Creek Events & Venues beginning at 5:00 p.m. More information about the event and the Community Campership Council can be found at www.kidstocamp.org; tickets are on sale. Read more about OSCAR® EXPERIENCE VIEWING PARTY IN SAN DIEGO FEB. 24: BENEFITS COMMUNITY CAMPERSHIP COUNCIL INC.
January 12, 2011 (San Diego) – Want to cook up a dish savored by your favorite Hollywood celebrity from a bygone era? Frank DeCaro, author of The Dead Celebrity Cookbook—A Resurrection of Recipes from More than 145 Stars of Stage and Screen, will sign copies of his book January 14 at Babette Schwartz gift store, 421 University Avenue in Hillcrest.